The very pretty Sapphire Hardanger bookmark is worked in shades of blue, green and lilac. If you've never tried Hardanger before, this project will take you through the steps to make it, with step-by-step photographic instructions. 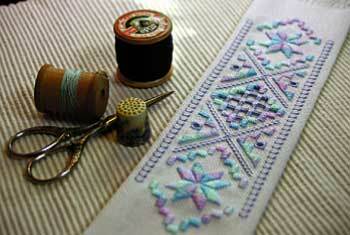 For more experienced Hardanger embroiderers, this project makes a lovely quick gift. For quick finishing, the ends of the bookmark are fringed. Chart and step-by-step instructions included.